Previously I had used the Hassbian image of Home Assistant on a Raspberry Pi 3 that also included AppDaemon. The new Docker version runs on a sixth generation Core i5 and regularly runs at less than 10% of processor capacity. I plan to use this extra capacity to add Plex and other useful containers. In a recent post I described how I set up a water meter that provides a pulsed output to a Raspberry Pi GPIO pin. 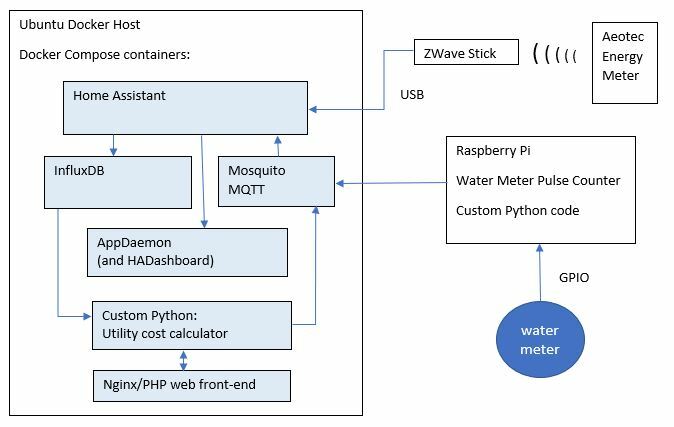 Custom Python code on that Pi converts the pulses to MQTT packets that are sent to the Mosquito broker that is connected to Home Assistant. I’ve replaced the stock Home Assistant SQLite database with InfluxDB, a database that is designed to hold a high volume of unstructured data. That data is regularly queried by some custom Python code in another container. That container also holds a SQLite database with recent utility bill cost data. This information allows the code to calculate daily and monthly costs and then send that data as MQTT packets to the broker. That data then becomes available to Home Assistant and HADashboard for display. The electricity meter works in a similar manner. It is a standard Aeotec Z-Wave Gen 5 Home Energy Meter. You can pair it to your Home Assistant installation like any other Z-Wave device, and then power and energy data will be available. To add the utility cost data, I use additional Python code that reads the usage data from the InfluxDB and then calculates the cost based on cost data in the SQLite database. Obviously I have not provided all the details here needed to replicate this system. That would take many pages of text. My goal in describing this setup is to show what is possible and how different pieces can fit together. With a little creativity, a lot of Googling and some basic coding skills, you can come up with some amazing Home Assistant displays and automations!